Existing home sales slipped in September, following a month in which sales were almost totally flat. The National Association of Realtors® (NAR) said that closed transactions for existing single family homes, townhouses, condos, and cooperative apartments was at a seasonally adjusted rate of 5.15 million in September. This was a 3.4 percent decline from both the July and August rate, both of which came in at 5.34 million units. The last month in which existing home sales posted a month-over-month gain was in March. Sales are now down 4.1 percent year-over-year from the September 2017 rate of 5.37 million. 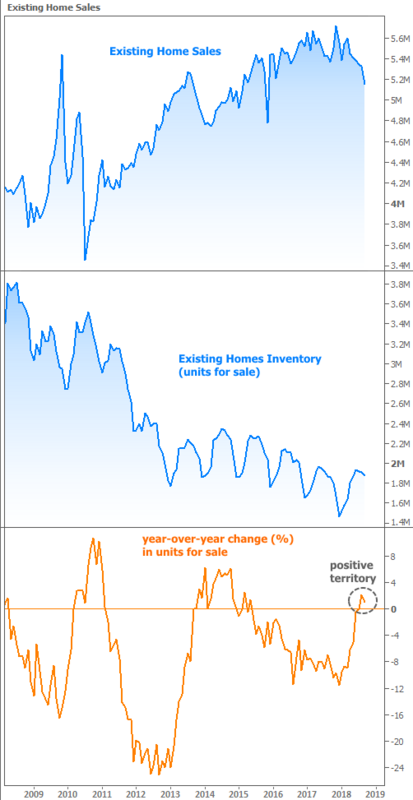 Analysts polled by Econoday, after overshooting the mark for five straight existing home sales reports, lowered the bar for September. Despite this, the NAR report missed even the lowest of predictions which ranged from 5.190 to 5.380 million. The consensus was for a rate of 5.300 units. Sales of single-family homes fell by 4.0 percent to a seasonally adjusted annual rate of 4.58 million in September compared to 4.74 million in August and are 4.0 percent below the 4.77 million sales pace a year ago. Existing condos and cooperative apartments were sold at a rate of 570,000 units in September, down 3.4 percent from last month and 5.0 percent from September 2017. The median existing-home price for all housing types in September was $258,100, an increase of 4.2 percent from the median of $247,600 in September 2017. September's price increase marks the 79th straight month of year-over-year gains. The median existing single-family home price saw 4.6 percent annual growth to $260,500 and the median existing condo price was $239,200 in September, representing relatively modest 1.5 percent year-over-year appreciation. First-time buyers accounted for 32 percent of sales in September, up slightly from both August and a year earlier and the investor share was 13 percent, 2 points lower than in September 2017. Twenty-one percent of sales were all cash, a number that has remained fairly consistent for some time. Two percent of September sales were foreclosures and 1 percent were short sales. The aggregate of distressed sales was the lowest since NAR began tracking the statistic in October 2008. The lackluster pace of sales was evident in all four regions. Existing home sales declined by 2.9 percent in the Northeast to an annual rate of 680,000 and was down 5.6 percent from September 2017. The median price in the region rose 4.1 percent on an annual basis to $286,200. Existing home sales were unchanged from August in the Midwest, an annual rate of 1.28 million. This is 1.5 percent below sales a year ago. The median price was $200,200 a 1.9 percent annual increase. Sales in the South decreased fell 5.4 percent to an annual rate of 2.11 million and were lower than the 2.12 million posted a year ago. The median price in the South was $223,900, up 3.0 percent year-over-year. There was a decline of 3.6 percent in existing home sales in the West, to 1.08 million, a 12.2 percent slowdown from last year's sales. The median price was up 4.1 percent to $388,500.